Now you can buy the same high-strength surface cleaning formula used by professional thermal engineers. Indigo Xtreme Clean™ works better than other products. It possesses higher solvating power than Isopropyl Alcohol (IPA) and emulsifying cleaners (such as ArctiClean™), yet leaves no residue. Unlike acetone, xylene, and toluene, Indigo Xtreme Clean is non-flammable and is safe for most surfaces. Indigo Xtreme Clean is easy to use. Simply place a small amount on a clean, dry cloth, wipe the surface clean. One and done - no fussy two-step process. The surface will be left completely free of any thermal grease or stray material and ready to accept a superior thermal solution such as Indigo Xtreme™. When you want top thermal performance, you don't need lemons or fresh scents. You need a robust surface cleaner as good as your thermal interface. That's Indigo Xtreme Clean. Get the edge professional thermal engineers rely on. Get Indigo Xtreme Clean. Indigo Xtreme Clean™. Professional strength. Professional results. For detailed directions and safety information, please read the Indigo Xtreme Clean Instructions below and Material Safety Data Sheet (MSDS) found here . Use with adequate ventilation. Avoid prolonged contact. Keep away from children and pets. Do not ingest. Keep away from flame, sparks, or high intensity heat source. For additional safety and handling information, refer to the Indigo Xtreme Clean MSDS. 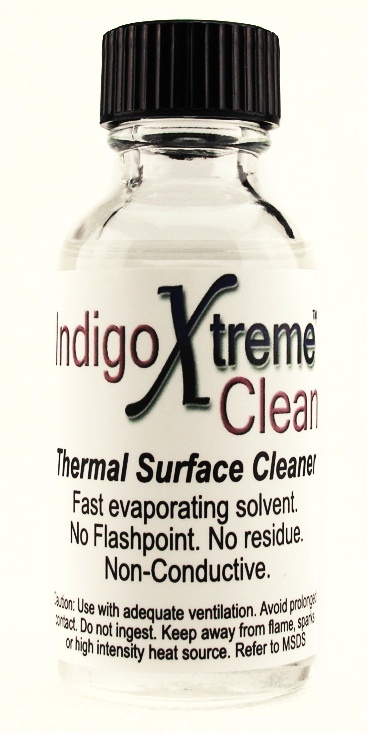 Although Indigo Xtreme Clean is compatible with most surfaces, avoid contact with plastics (such as keyboards, computer cases, cooling fans, some waterblock housings, coolant tube fittings, cables, etc.). Also, avoid contact with elastomers (such as coolant tubing, gaskets, etc.). Use powder-free gloves to prevent any finger oils or contaminants from contacting the CPU lid and heat sink and to prevent skin contact with Indigo Xtreme Clean™. Using a dry cloth, apply pressure to thoroughly remove any existing interface grease from the CPU lid and heat sink. Clean with fresh areas of the wiper cloth until no visible grease residue is detected on the wiper. Saturate a dry, lint-free cloth with Indigo Xtreme Clean™; thoroughly wipe the CPU lid; repeat with the heat sink interfacial surfaces. Continue to wipe each surface with fresh areas of the wiper until no visible residue is detected on the wiper. Wipe all surfaces of any visible lint, fibers, or particulates. Be prepared to wipe the CPU lid and heat sink surfaces immediately upon saturating each dry wiper cloth as the Xtreme Clean™ solvent will quickly evaporate. When finished, seal the saturated cloth in a plastic bag and dispose properly.